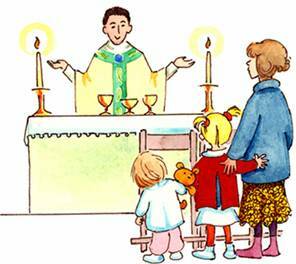 I try so hard to have faith, but I have never figured out the best way to take kids to Mass. I mean, on the one hand, there’s the Real Presence, and taking your children to see the Miracle that redeems mankind is unquestionably of utmost importance. But on the other hand, there’s the mental mumbling that questions whether it’s wise to drag them to long services that are late in the day, and in my case this particular night – alone. So I found myself on the evening of Maundy Thursday trying to come to a decision. My husband wasn’t home, but I really wanted the five youngest children to be there and witness this event. One of them is preparing to receive First Communion, one remembers it from last year, two are still looking forward to it. They go through life together. The baby, well the baby goes wherever I go. Feeling confident with my decision, I dressed them all up and put them in the truck. Off we went…sat right up front so the kids could see everything. I felt good because I was saying “OK” to God. It started out good too. Five minutes later, I was at the back of the sanctuary standing near the front doors to the church because the baby decided to wail, pointing to horses in a picture book and trying to mentally make the distinction between infant gibberish about “goggies” and the sacred words of the priest, all the while trying to keep my eyes focused on four little blonde heads a-bobbing – unattended – up front. Things appeared to be falling apart fast. I was trembling, it was like watching a large glass bulb hang mid-air by a thin thread. I hoped, prayed and pled that nothing snapped. And I just knew that people were judging me, wondering if I had lost my mind. I tried not to worry as Fr. Erlenbush encourages us to do, but I did anyway. Then the little seven year old communicant-in-preparation started to lose it. She does this methodical rocking, whining thing when she gets stressed out, and it always elevates. I could see her swaying, could hear her low whine building. Then the little sisters found my purse and discovered the deck of insurance cards (large family, lots of individual cards) in their special wallet. Oh dear! Plastic cards were waving through the air, heads are twisting from side-to-side. The poor oldest sister turned around to cast a look of despair. I’d abandoned her. What could I do? The priest was reading the Gospel and I wouldn’t walk down the aisle and disrupt it. But my kids were doing it anyway. I held my breath, and prayed that someone angelic would spiritually duct-tape my children – now! You know the feeling if you’ve been there. It’s scary. You try to have virtuous thoughts, but…well, disturbing scenarios loom large. And just like that, a woman walked in and needed my attention. She had questions. (But the kids!!!) She wanted to know if this was the service for Maundy Thursday. Wow! She knew what that meant. I had only learned it earlier that day from Dr. Taylor Marshall at Canterbury Tales blog, another reason why I really wanted to attend the service. I told the woman that, yes, this was the correct service, and then she wanted to know where to sit. I was stumped. “Well, I’m a convert of six years, so you probably know more than I do, but I think you can sit anywhere unless you are getting your feet washed.” She said she really just wanted to pray so I told her, quickly, about the Perpetual Adoration Chapel, glancing with obvious anxiety at the girls in the sactuary. She pressed on. I continued to explain how it was constantly occupied by someone praying so you can go there any time of day or night and pray before the Blessed Sacrament, but still in quietness and privacy. She said she didn’t want privacy, she wanted community. Then she told me she wasn’t Catholic. She just wanted to come and pray, she had heard of the service and found the parish. I had the pleasure of welcoming her, encouraged her to slip in, sit anywhere, watch the ceremony and pray. I noticed the girls had suddenly calmed down in the 60 seconds that had just transpired. A miracle? Yes, undoubtedly. As it turned out, we got through the service fine, and the other parishioners around us helped out. We saw the washing of the feet, prayed for vocations, joined in Communion, watched the procession conclude as the Blessed Sacrament was taken to its place of reposition. During the final procession, the choir sang, “Stay with me” over and over. The girls were mesmerized, and so was I.
That’s when I thought of the disciples in the garden staying with Jesus while He prayed, unable to live up to the perfection they thought they ought to have for their Teacher because they fell asleep. Peter would also fail and deny Christ, but he would go on to spread the Gospel message for the rest of his life until he was martyred by crucifixion, upside down. I am no saint, but in that realization I was able to lighten up and see things in better perspective. However I may have failed, we were all there. And in God’s mysterious ways, He had also put me there to greet a newcomer who wanted to pray. I remembered the verse Dr. Marshall had given. A relationship with Christ is personal, He wants us to stay with Him, and when we fail as humans in this muddled world, He is there to guide us on in love and unite us in surprising ways. Afterward, we jumbled out to the truck, greeted in the parking lot by many people who said they were glad to see us, and we trollied on home as the baby, typically, wailed in the prison of a cart seat. I fumbled for the song that always gets him to be quiet, and when it played, I couldn’t help laughing out loud because it was so wrong, and yet so perfect. Previous ArticleHe Has Risen, Alleluia! We Have Risen With Him, Alleluia!